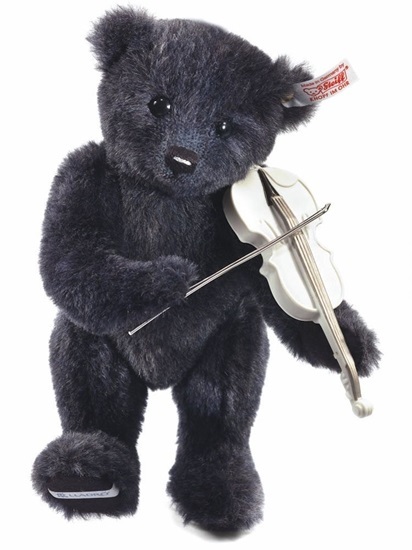 New in 2012 this bear is a result of a partnership between Steiff and Lladro, limited edition of 1000 pieces. New in the fall of 2012, "Lladro Violinist Player" is a North American Limited Edition of only 1000 pieces. He plays "Our Love" from Romeo and Juliet and stands approximately 10-inches tall. He is 5-way jointed and made with the best alpaca quality fur and his nose and mouth are hand-embroidered with black and silver thread. The Lladro porcelain feature-the violin-is handcrafted and decorated with platinum luster in an entirely artisan process. "Lladro Violinist Player" comes with a C.O.A., collector’s box, and shipper.